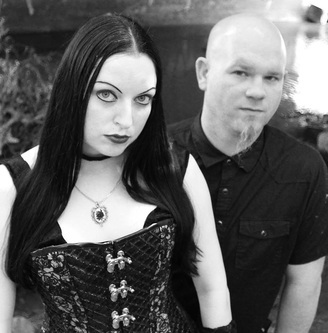 Petals And Thorns is an American musical duo, formed in 2009 in Cleveland, Ohio. The duo is a female/male studio collaboration between vocalist Mia Petals and multi-instrumentalist/producer Johnny Thorns. Combining sometimes fragile, yet sometimes cabaret, and other times angelic female vocals against gritty guitars, haunting synths, and delicate piano sounds; they create what comes across as darkwave/electronic/rock with a touch of metal. The duo met in 2009. Musician Johnny had been working on a project intended for female vocals starting in 2006. He had attempted to work with three different vocalists between 2006-2008, before meeting Mia (via the internet) through a mutual friend; only to then realize they had both known each other earlier in life. Taking some time to get aquainted musically, they didn't release any material publicly, until 2011. The initial Petals And Thorns demos were self-leaked as free downloads online, and reached around 3000 downloads before the band decided to remove them in light of an official finished self-made release. Garnering the early attention of DJs' and internet radio shows, such as: DJ Raven Digitalis' "Midnite Soundscapes", Tampa based "Dark Horizons", University of Columbia's "Dark Entries", Josh Alexander PDX in Portland, and having starred as musical guests on the Cleveland area local television show "The Daughter Of The Ghoul Show", all played a significant part in helping to increase the band's visibility prior to having their official release. Fast forward a couple of years, a handful of performances locally and regionally were had, and the additional songs for the debut album to be completed, were finished. A landmark performance was had for the farewell of Lestat, with Petals And Thorns as the direct supporting act. The original release of "The Broken Mirror" was, via Bandcamp, on Oct 29, 2014. The band found last minute funding for a limited 100 CD pressing which was made officially available through their own BigCartel online store on December 30, 2014. "The Broken Mirror" became offically available via the normal digital mediums of iTunes, Spotify, Amazon, Google Play, etc on February 10, 2015. Early 2015 would find Petals And Thorns' first print interview with "Gothic Noir Magazine", and songs from the album would be featured again on "Dark Horizons" , "Dark Entries", and "Midnite Soundscapes" radio shows, as well as "Communion After Dark", Cleveland's own "Dare Waves" and "COMA Music's Ooontzcast Compilation Vol 1". Album cover art by Mia. Not satisfied with the idea of just releasing music out into the world without the financial backing to promote it properly through normal means (via touring or advertising), the duo set out to instead do what they could for bigger promotion of the album by filiming DIY music videos, one song at a time, starting in November of 2014. You can see the videos ----> here. The band's second video "Immoral Disclosure" was featured on the "Right This Minute" website and hailed as thought provoking. On September 9th, 2015 "The Broken Mirror" was officially added to Pandora radio. Click here to listen to Petals And Thorns radio. "Method To The Madness" was featured on the issue #39 of Devolution magazine's cover mount cd compilation, release December of 2015. January 2016, the duo officially announce that they have been writing their second album, and that they will be working with long time Cleveland area studio engineer / producer, Brandon Youngs of Track Six Recording Studios. They also announced that they do no expect to see the album finished until sometime late 2018, at the very earliest. January 2018, the duo have announced that they are getting pretty close to having their new album written, but that it will not likely release until Fall of 2019. They began to take pre-orders, stating that the album will only be exclusively available on physical CD to the fans who pre-order it on their website. They have also made mention that they would be sharing exclusive behind the scenes clips to those who have pre-ordered the album. For more information go -----> here! To pre-order, go here and donate at least $20 USD!